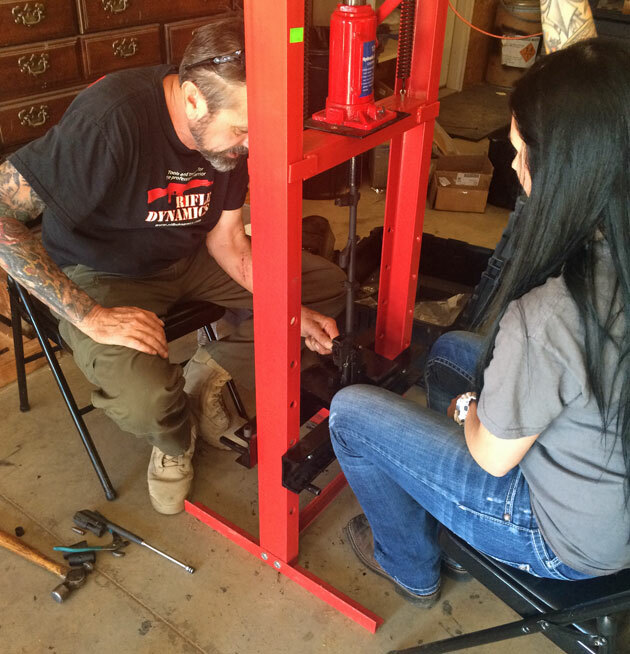 A few weekends ago I was able to attend the Rifle Dynamics AK Builder class in Tulsa, OK. I purchased the class as an early Christmas gift for my girlfriend. Sheâ€™s helped me build a few ARâ€™s, and said she wanted to build her own rifle from the ground up. Iâ€™ve wanted a Rifle Dynamics AK for some time so I figured win, win! While I spent most of the time spectating and taking pictures, I did get a few opportunities to jump in and help some folks out that were having issues. 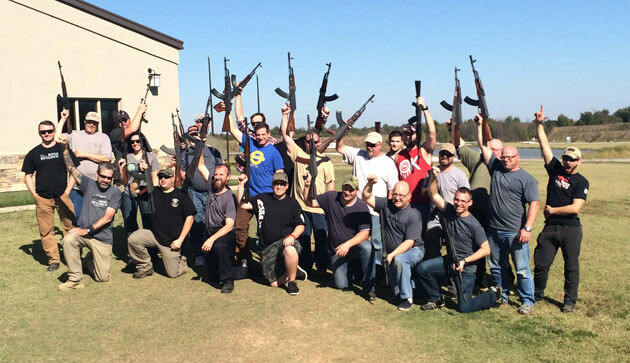 The class was held at the US Shooting Academy in Tulsa and hosted by Jeff Hensley. Also in attendance was Kirill Gromov, lead instructor of Pravda Group, a man whoâ€™s extensive use of the AK system in his military career, who also helped to supplement the class. Day one started off with introductions, safety briefings, and a brief run-down of how the weekend would go. 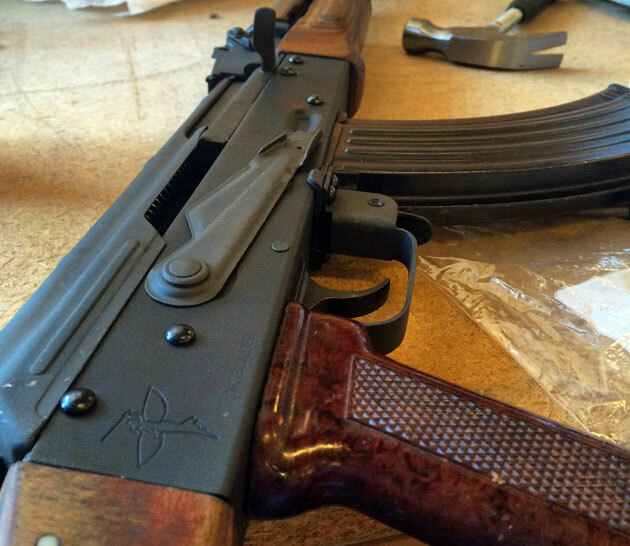 Jim soon went into the history of the AK, its evolution from stamped parts to milled, then back to stamped and the reasons behind the changes. Iâ€™ve been shooting, training on, and messing with AKâ€™s for the past 10 years and still didnâ€™t know half the stuff we learned in the first few hours of the class. After the history lesson, Jim went on to dispel a lot of the myths and rumors that surround the AK: itâ€™s inaccurate, itâ€™s a peasantâ€™s rifle, itâ€™s only good for 50 meters, etc, etc. If there were any doubts about the Rifle Dynamics crewâ€™s passion of the AK47/74 system, theyâ€™re put to rest within the first hour of the class. After the overview of parts, and lineage of the AK, students dove into their parts bins. Students had the choice to build either 7.62 or 5.45 AKâ€™s. They started with a receiver, and were put to work. Each process was explained in detail by either Jim, Calvin, or JB, before the students were put to work. What I found especially important was that as the pieces of the rifle were explained, so were the tools, and the reasoning behind why certain tools and processes were preferred over others. This in-depth explanation really gave me a look into the heart of the Rifle Dynamics rifles and why they are what they are. Not just another mass produced WASR-10, or clone gun, but an actual AK derivative hand built from the ground up. Day one culminated with front and rear trunnions and trigger guards riveted into place. Students were responsible for pressing their own rivets, AND fixing them if they werenâ€™t pressed right. All riveting was done under the watchful eye of Jim, JB and Calvin, and we soon learned why AKâ€™s tolerances vary so much. Day two started with a little bit more lecture, going more in depth with the processes of pressing in barrels, the importance of good receivers, learning about head spacing, canted sights, use of corrosive ammo, and basically giving us a much better appreciation of what separates a $600 AK from a $1600 AK. Iâ€™ve owned Bulgarian, Romanian, Chinese, Hungarian, Polish, American, Yugoslavian and Egyptian AKâ€™s, and I always thought an AK was just an AK, the only differences were calibers, wood vs polymer furniture, and fit and finish. 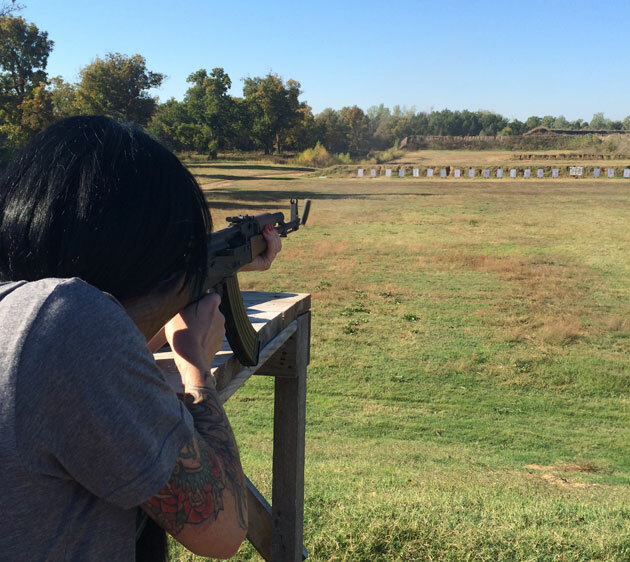 As day two pressed on, I soon learned what separates the Rifle Dynamics gun from the rest. As Jim explained the builds more in depth, it was clear that each rifle thatâ€™s built is built to much different specs than an off the shelf gun. The best parts are chosen, tested, then evaluated for use in custom rifles. As Jim said, before he chooses which parts to use, he runs the parts FULL AUTO. If they stand up to that abuse, then they pass muster. I donâ€™t know of too many other people out there building AKâ€™s that put that much effort into making sure the parts work in their guns. 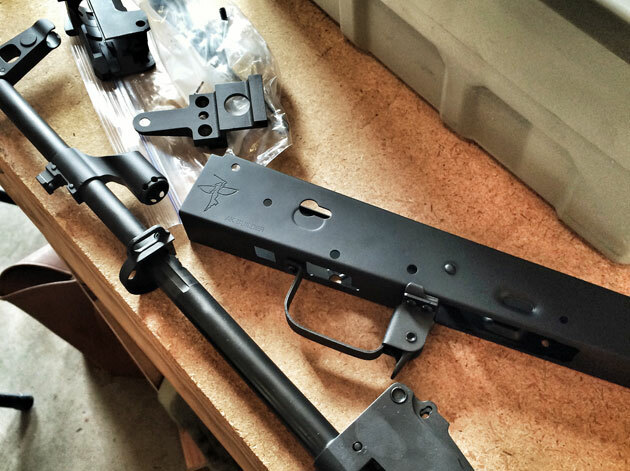 With barrels pressed in, headspace checked, and triggers installed, the rifles were starting to take shape. Students were again able to get hands on with the 12 ton press, drill presses, dremels and files to smooth and bore out holes, and of course, big hammers. Last was adding the furniture, which completed the rifles. Day two ended with 22 complete AKM pattern rifles ready for test firing the next morning. It was pretty amazing to see the guns come together all at once from 22 boxes of parts. Day three started on the range. A safety briefing followed by range commands and then 22 AKM rifles went to the firing line to burn in the barrels. First, a mag dump to function check the guns, followed by a 25 yard zero, then the students were brought back to test the guns out at distance. Students were able to shoot steel targets at 100, 200, and 300 yards. Iâ€™m pretty sure there wasnâ€™t a student in attendance that wasnâ€™t shocked that they were able to reach out past 100 yards with their guns and hit what they were aiming at. My girlfriend, who had previously only shot an AR15 with iron sights was able to engage steel at 300 yards with the help of a spotter. Students were able to try each others guns (some folks opted to mount Ultimak rails and optics on their guns) as well as Jimâ€™s demo guns. Once the ear to ear grinning stopped, and the sound of lead hitting steel died down, it was back to the classroom to tune the guns. Everyone had to take notes during the test firing, of their guns performance, and then go back to the shop to smooth rails and bolts with sand paper and files. Once that was complete, a final inspection and head spacing check was performed by the crew, and 22 new rifles were in the hands of some fine Americans. The class wrapped up with some final words from Jim about the AK weapons system, care and maintenance, and what students should look to be doing in their future endeavors of building rifles. Iâ€™ve been through different armorerâ€™s classes, as well as many different types of training classes, and the AK Builder class may have been one of the most fun and informative classes out there. Jim and the crew are a wealth of knowledge, and their passion for teaching is evident and really what drives the class. While this class isnâ€™t an â€œarmorer classâ€ per se, it went more in depth than any other armorerâ€™s class Iâ€™ve been to. The crew was sure to show explicit examples of the different tolerances, problems, and solutions one may run into while building and shooting an AKM rifle. To say I was impressed is an understatement. As I stated before, Iâ€™ve owned a number of AKâ€™s in my life, Iâ€™ve broken down a bunch of them, and Iâ€™ve shot even more. The knowledge I gained in 3 days with the Rifle Dynamics crew alone was worth the price of admission. When I told friends about the class, the first question out of their mouths was â€œhow much?â€, and then they balked at the $1900 price tag. Yes, the class is expensive, yes I sold a gun to afford it, but in reality, the price of admission is fairly cheap if you break the costs down. You build your very own rifle, a rifle that if you were to buy from RD directly would cost you $1200, and you get to spend 3 days with a group of like-minded individuals, as well as learning from one of, if not the top AK rifle builders in the country. What makes this class different than others similar to it that Iâ€™ve taken, are the instructors. Yes, they give you the guidance, but they also donâ€™t baby anyone. Iâ€™ve been to classes before where if a student is having a hard time, the instructor will do the work for them. Personally, I believe thatâ€™s a poor training model and not how one should be taught. If you made a mistake with the build, it was your responsibility to fix it. The guys would tell you what was wrong, and provide feedback, but as JB said at one point “itâ€™s not my gun, itâ€™s yours, I want YOU to see what it feels like to rivet the receiver, and I want YOU to see what it feels like to grind the rails on YOUR gun.” To me, this made all the difference in the world, and provided students with ample learning opportunities throughout the weekend. Iâ€™d recommend this class to anyone that owns or wants to own an AK47 type rifle. There isnâ€™t a better crew you could learn from. Jim is an amazing instructor, patriot, and voice for the Second Amendment. His passion for what he does, the knowledge he instills, and his desire to help others really fuels the class. JB and Calvin, Jimâ€™s assistant instructors kept the pace and tempo of the class going, as there was some lag time with 22 students and only 3 machines to rivet on, but that was to be expected. Last but not least, Melanie, the self-proclaimed â€œDen Momâ€ did an incredible job with scheduling, communication, and updates from 2 months before the class started, until the final bell. Also thanks to Jeff for setting up the class, and Kirill for his experience as well. Jim you have a solid crew, I thank you all for an incredible weekend and an even better early Christmas gift! Matt is the President and Lead Instructor at Down Range Firearms Training in Massachusetts. Matt is a multi-discipline NRA Instructor, a MA State Police Certified Instructor, a Utah BCI Instructor, and a Combat Focus Shooting Instructor. Matt also possess a Masterâ€™s Degree in Criminal Justice and Homeland Security and has worked in many facets of the firearms industry for the past 6 years. Sounds like a top notch experience. What an awesome Christmas gift. Great review. Taking an AK Build class from RD is definitely on my bucket list! Thanks for sharing your experience. I have been interested in building a AK but have been boggled by all the different variants. I think this should be the thing for me to do. Thanks again, keep up the good work.